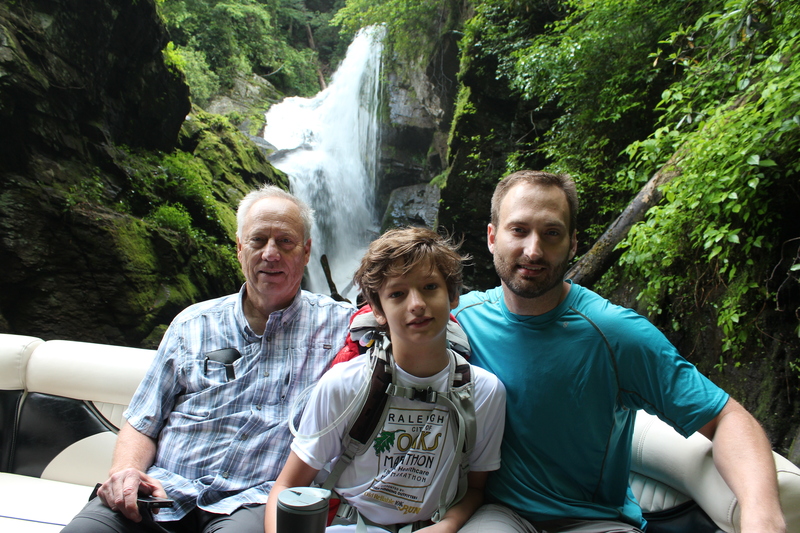 In spite of the relatively short duration of our trip, by the time we woke on Sunday morning – our final day on the trail – it seemed like ages since Brooks had dropped us off at Laurel Falls. With only a five and a half mile trek to Table Rock, we were excited about completing our journey and about the upcoming night in Greenville (wives! showers! cold drinks!). But we were also determined to enjoy our last hours on the trail. Our walk on Sunday would include Pinnacle Mountain and Drawbar Cliffs which were reputed to provide breathtaking views. They would not disappoint. We ate breakfast, quickly stuffed our packs and were walking by 8:30. As was the case throughout our days on the trail, Ashten took the lead. At 12 years old, he definitely had the most energy of anyone and took great pride in being our “spider web catcher”, knocking down webs for the rest of us. 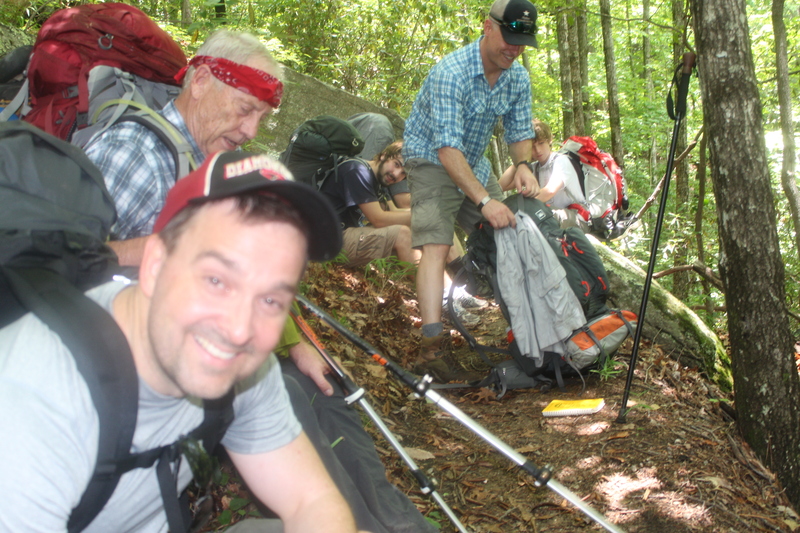 The walking was strenuous and uphill as we made our way to a bald granite overlook a few hundred feet below the tree-covered summit of Pinnacle Mountain. 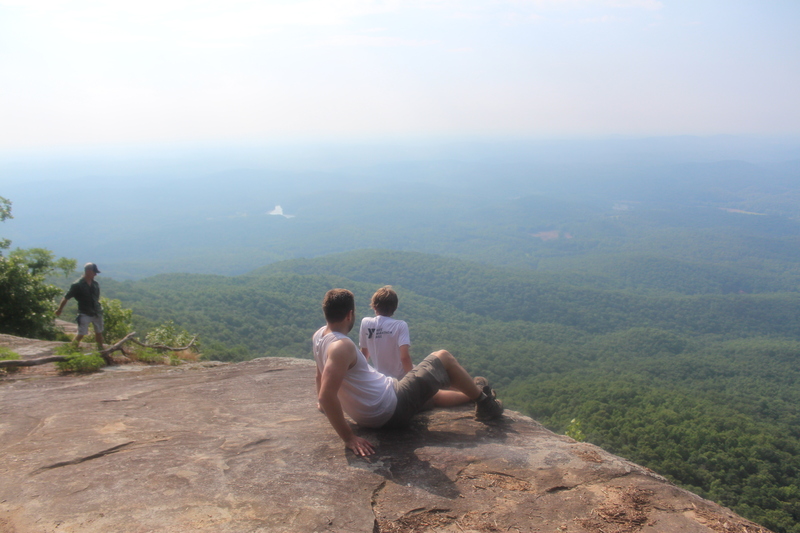 Though Sassafras Mountain is the highest peak in South Carolina, a portion of that mountain extends into North Carolina, making Pinnacle the highest mountain entirely contained within the borders of the Palmetto State, at 3,415 feet. The views from the granite outcropping on the eastern side of the mountain were truly spectacular. It was a clear day and we could see for miles, including outstanding views of Table Rock and Paris Mountain. We lingered, snapping pictures and soaking in the incredible scenery. Everyone agreed, it was worth the 22 mile walk just for this vantage point alone. From there it was less than a mile to more stunning scenery at Drawbar Cliffs. Where the outcropping at Pinnacle was a true cliff with a dramatic and knee buckling drop-off, Drawbar was a gently sloping granite face which invited – insisted upon – a lingering stop. We happily did just that. With views of Lake Keowee and miles beyond, we were again handsomely rewarded for our efforts. At length, we bid adieu to Drawbar and rejoined the trail. From here it was a relatively easy downhill jaunt over the last three miles to Table Rock State Park. After seeing almost no water on Saturday, it was in abundant supply on this last stretch, including over a dozen medium to small waterfalls. It felt like we were back in a rainforest, which technically speaking, we were. 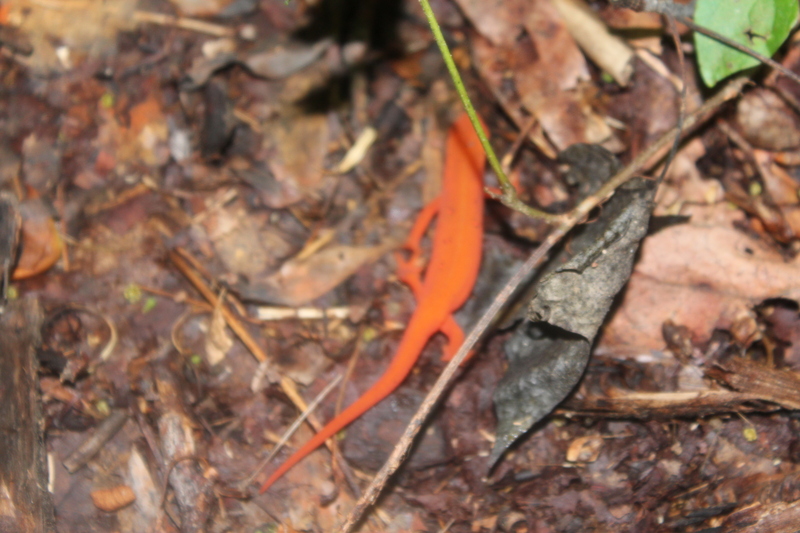 Along the way we passed an intriguing orange salamander and two snakes – the second of which darted onto the trail right in front of Cole, causing him to shatter the State high jump record. As we grew closer to Table Rock we began to pass day hikers headed in the opposite direction to take in the views we had just enjoyed. From our bulbous packs, generally disheveled appearance and impressive bouquet, they likely thought we were completing the full 77 mile hike from Oconee State Park. We were happy to let them think that. By noon we were done. Back at the Table Rock parking lot, we made a b-line for the lake and a refreshing dip. By 1pm, we were reunited with Fran, who had spent the previous evening in nearby Hendersonville, N.C. and had thoughtfully packed a cooler of cold Coca-colas for us. We loaded our packs and drove south to Traveler’s Rest where we had a highly anticipated lunch of burgers and beer at Shortfield’s. We called wives, debriefed about our trip, caught up with Fran and entered a state of enraptured joy over our first “real” food in several days. We were a grubby but happy bunch. It was wonderful to see Melissa and the other Herr girls when we arrived at the Hampton Inn just off Main in downtown Greenville. Melissa gave me a warm hug and peck on the cheek but otherwise, smartly kept her distance until I could shower. I can’t say that I blamed her. We gathered for drinks before dinner at Sip – a cool rooftop wine bar with great views of a bustling Main Street two floors below. Afterward, as we ambled along a busy sidewalk on the way to dinner, it felt strange to walk without a pack, unburdened and light of step, and odd not to be on the lookout for a suitable campsite at that time of day. I was reminded how quickly you fall into routine in the woods and how powerful those routines can be. And despite the unbridled joy of a much needed shower and the fun of being with family in my old town, I found myself missing the trail. We ate that night at Soby’s on Main, a downtown Greenville institution since I lived there in the late 90’s. It was a sensational meal and still somewhat novel to eat off of plates rather than out of a freeze-dried meal sack. After dinner, Melissa and I strolled hand-in-hand along Main in the fading light, through Greenville’s recently revitalized West End district. The West End area was, when I lived in Greenville, an old warehouse district, mostly abandoned and in serious decay. You wouldn’t walk there after dark. But over the past 15 years it has experienced a tremendous revitalization, including the demolition of Camperdown Road bridge, which opened up views of the lovely Reedy River Falls. The concrete monstrosity of a bridge was replaced by a dramatic and elegant pedestrian bridge and below that, a revitalized Reedy River Park. This investment in turn, attracted a splendid minor league ballpark and countless restaurants and shops as well as the renovation of most of the old buildings along the Main Street corridor. The result has been nothing short of amazing. Downtown Greenville is thriving and provides a powerful testament to the importance of public green space. We walked 22 miles over two and a half days. We spent two nights on the trail, clambered over some challenging peaks, sweated buckets, enjoyed some spectacular overlooks, burned countless calories and overcame a few obstacles along the way. 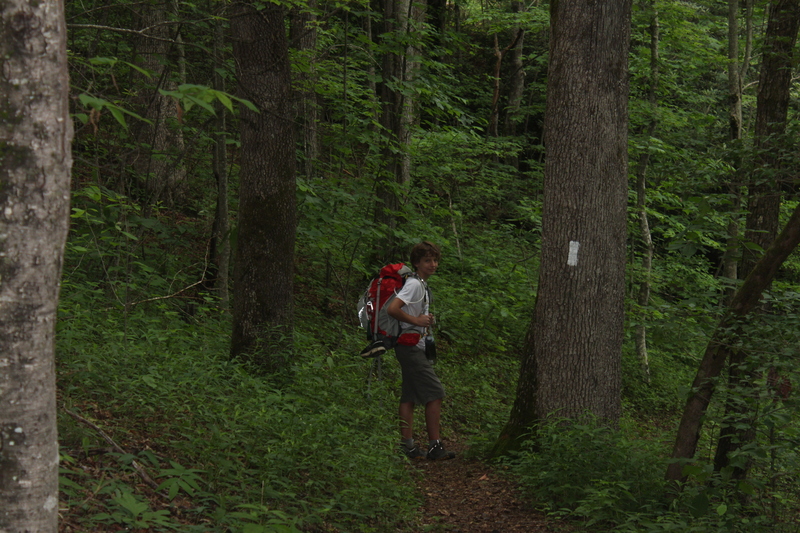 But to put this into humbling perspective, we covered just 1% of the length of the 2,180 mile Appalachian Trail. We averaged around 8.8 miles a day during our walk. 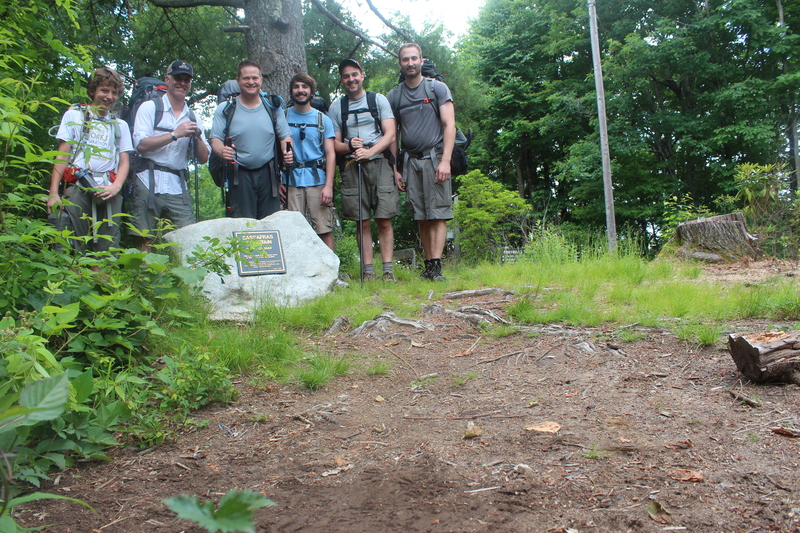 At that pace, hiking the Appalachian Trail would take us over eight months. 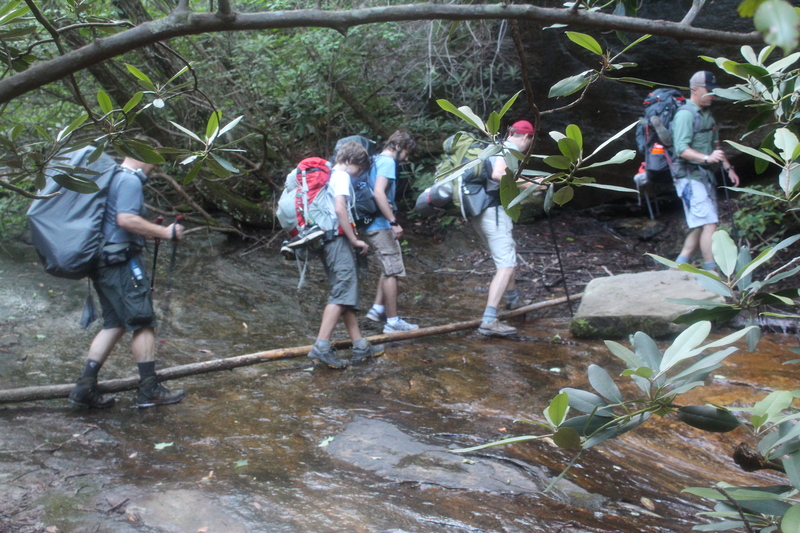 It takes most through hikers five to six months. On Monday I found a four foot high wall map of the AT at Mast General Store in Greenville. To put our little walk into further perspective, those 22 miles, when measured against the four foot wall map, represent about the width of a fingernail. Saturday we were up and fed with packs on, ready to go by around 8:30. I had spoken with an early arriving day hiker in the parking lot next to our camp who agreed to give Fran a ride back to Table Rock when he and his companion finished their hike. He was a gruff, ex-drill sergeant, card-carrying NRA type, but friendly enough once I got him talking and more than willing to help out. Transportation arranged, we said grudging goodbyes to Fran, donned our packs and started down the gravel road to fill our bottles at Estatoe Creek before heading out for the day. Twenty minutes later, as Patrick and I stood along the highway waiting on the others to finish pumping water, Patrick noticed a family in a van who had stopped directly across the road. There were four of them, a mother, a father and two small daughters who had stopped to snap pictures against the backdrop of the Estatoe. Without hesitation, Patrick hustled across the road to ask them if they would be willing to give Fran a ride, which would prevent him for having to wait God-knows how long for the returning day hiker. There was something remotely odd in their nature. Nattily attired for a Saturday morning, they struck me as high mountain Pentecostals of the snake-handling variety, perhaps out to harvest a few Copperheads and rattlers for Sunday service. But they were unceasingly sweet-natured and eager to help, which was the main thing. As it turned out, they were en route to pick up their two other children from a church camp just across the North Carolina line and would be driving right by Table Rock on their way back home. They readily agreed to take Fran. I rode with them back up to the parking lot where Fran sat waiting. He seemed a little perplexed to see me again so soon, but was relieved to have a ride after I explained the situation. I made introductions all around, loaded his pack in the van and caught a ride with them back down to the highway. Fran seemed thrilled with the turn of events, probably just as much for having someone to chat with as his earlier-than-anticipated rescue. He teased us good-naturedly about his comfortable seat in the van and as soon as I exited, they were off. Relieved to know Fran wouldn’t have to sit in the parking lot all day, we crossed the highway to the waiting trail and started the immediate uphill grind that would dominate the better part of our day. From US highway 172, we had 4.5 miles of walking to the top of Sassafras Mountain, the highest peak in South Carolina at 3,564 feet. Now 3,564 feet doesn’t sound very high, especially compared to the “fourteeners” out west, or even to 6,684 foot high Mount Mitchell in North Carolina, which is the highest point east of the Rockies. But let me tell you, it’s plenty high. Especially when you gain 1,900 feet over the course of four and a half miles to get there. It was strenuous hiking. Along many sections, wooden steps were built into the side of the mountain at angles so steep we were frequently on all fours, as if climbing an extension ladder. The humidity was high and the sun was rising fast. It would be well into the 80’s that day and we were all sweating copiously within a half mile. We took frequent breaks and gulped water with reckless abandon, fully anticipating ample opportunities to pump more throughout the day. This would prove to be a miscalculation. Walking in the eastern mountains, you never have a real sense of where you are in relation to the larger terrain. You rarely, if ever get above the tree line and so you trudge through a perpetual, indistinguishable corridor of trees. Just when you think surely you are nearing a summit and the welcome easing of the trail’s gradient you round a bend and face another long stretch of steep incline and unceasing canopy. Always, more uphill until you begin to wonder if you will ever get there. We finally, gratefully got to the top of Sassafras around 11:30. We happily unburdened ourselves of packs and plopped heavily down on rocks and even a park bench, thoughtfully placed to mark to the summit. We took a lingering, much-needed break for lunch, none of us eager to be the first one to lift a pack even long after the last morsel had been polished off. Sassafras is tree-covered, so the views were not great, but it was still pretty cool to bag the State’s highest peak before noon. Who turned off the water? Our plan was to hike another 1.2 miles to the John L. Cantrell home site. Cantrell was an early settler to the area and the ruins of his stone chimney are still present, surrounded by what is widely regarded as the best, most expansive and idyllic campsite along the entire Foothills Trail. Plus, there were supposed to be two water sources within .2 miles of the site according to the official trail guide. By this point we were carrying nearly empty water bottles and badly in need of resupply. We were thrilled as we entered the site and found, in addition to Cantrell’s chimney ruins, half a dozen neatly stacked stone chairs built around a large stone fire ring. It was truly a perfect campsite and we gladly took another long break, luxuriating in the stone chairs (I didn’t even realize it was possible to luxuriate in a stone chair, but believe me, it is). But after a minute or two we realized something was missing… the welcome, gurgling sound of stream water. After a quick search around the edges of camp and down the trail a few tenths of a mile, it was obvious we would have no water source here. Goodbye John L. Cantrell home site. So long, awesome stone chairs. Hello again, trail. We walked over relatively easy terrain for another three and a half miles before finding a very nice campsite hidden fifty yards or so off to the right at a dogleg bend in the trail. 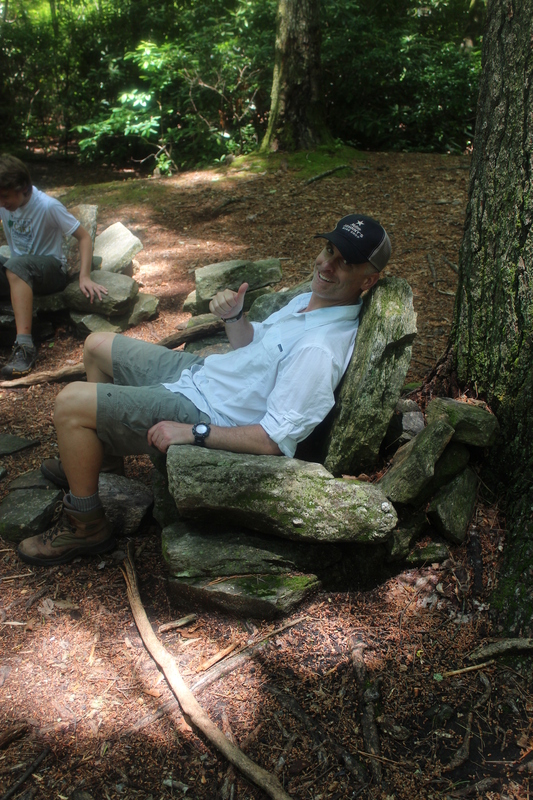 And whad’ya know… there were even a couple of stone chairs! Not to mention a meager but useable water source not more than a hundred yards away. We happily set up camp. Despite the ubiquitous sodden wood and thanks to Patrick and Cole’s relentless efforts, we were able to get a modest campfire going. We ate dinner and enjoyed the last few hours of daylight, telling stories, laughing about our experiences on the trip, sipping bourbon and generally enjoying each other’s company. 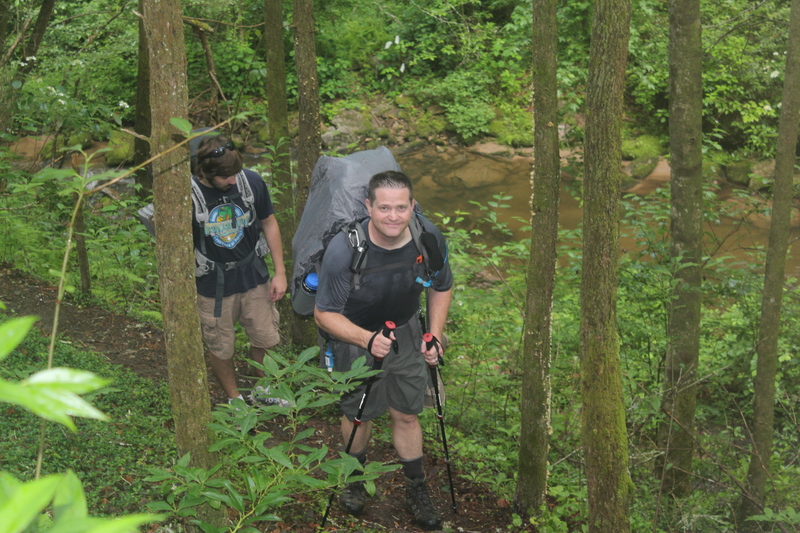 It had been a tough day – a long day, but a good one and we were now only five and a half miles from Table Rock. Tomorrow we would meet Nita, Melissa, Jenny and Lyn in Greenville where we would have hot showers, clean hotel sheets and a proper restaurant meal. I was reminded how much I had missed backpacking and vowed to do more of it. Its amazing what a good campsite, a hot meal and a swig of bourbon will do for morale, especially when fun things await the next day. According to the official site of the Foothills Trail Conference, there was a concerted push beginning in the 1960’s to protect the rugged beauty of the Appalachian Foothills, while at the same time making them more accessible. To that end, through the cooperative efforts of the U.S. Forest Service, Clemson University, the South Carolina Department of Parks & Tourism and Duke Power, a 77 mile trail began to take shape by the 1970’s which linked Table Rock State Park in the east with Oconee State Park in the west. The trail was completed by 1981. Some 17 years later, I was 26 years old and living in Greenville, S.C. when I happened to pick up a copy of Bill Bryson’s incomparable “A Walk in the Woods” – his brilliantly funny and informative story of walking the Appalachian Trail. I was immediately transfixed and hastily began planning a backpacking trip of my own. Some quick research led me to the nearby but until then undiscovered Foothills Trail. I placed a call to an old college roommate, Greg Maxwell, who gamely agreed to come along. 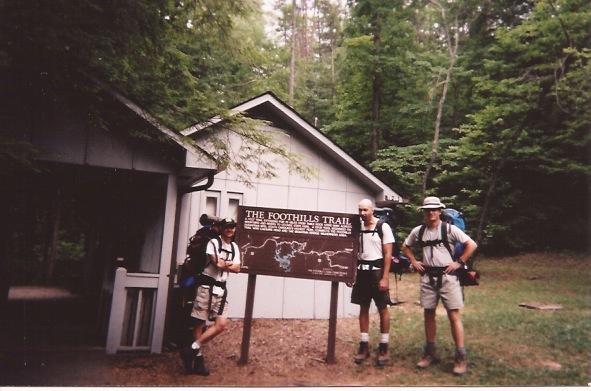 That 1998 hike – my first overnight backpacking trip – was a turning point in my life. It was a modest hike, all things considered. We didn’t even complete the entire trail. But it stoked a passion for the out doors that has stayed with me and in many ways has defined my view of the world. The crew assembled at Casa de Piercy the night before our trip and took inventory, packed our backpacks and made plans to meet at zero dark thirty the next morning for the long drive to Table Rock. Melissa’s Dad, Fran, had planned a surprise for us along the way, necessitating the extra early departure. The seven of us pulled out of Raleigh at 4:30am last Thursday. 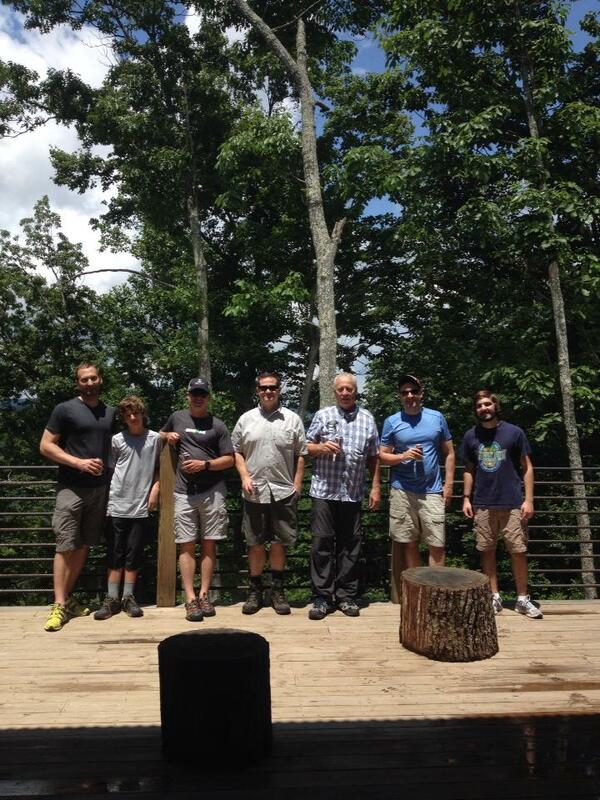 The surprise turned out to be a fantastic zipline excursion at The Gorge in Saluda, N.C. It was an incredibly thoughtful and generous idea on Fran’s part and we all thoroughly enjoyed it. After indulging in $1 PBR’s at the Gorge following our zipline we had a great lunch at The Purple Onion in downtown Saluda – a postcard worthy little mountain town just off I-26, between Asheville and Spartanburg. From there, we picked up a few last supplies (including two bottles of wine) at the hardware and sundry store in town before making the 45 minute drive south to Table Rock State Park where we were to meet our shuttle over to Devil’s Fork State Park, our destination for the night. I had arranged a van to shuttle us from one park to the other on Thursday afternoon and then a water shuttle across Lake Jocassee the next morning, which would drop us off on the trail. 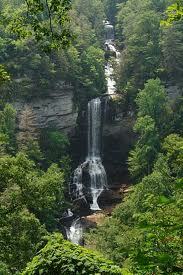 We would then walk 22 miles along the trail back to our cars at Table Rock. Both shuttles would be provided by Jocassee Lake Tours, owned by Brooks and Kay Wade, two of the kindest, most accommodating and informative folks you could hope to find. Kay shuttled us to Devil’s Fork, a state park I had never been to, situated on the comely southern shores of spectacular Lake Jocassee. We quickly made camp and explored the park a bit. It was around 8pm by the time tents were set up and a camp fire was going. A bluish, near-dusk haze settled on the lake and mountains to the north while the descending sun cast gauzy brush strokes of burnt orange and faint purple in the gathering clouds. The lake beckoned and I put off a dinner of grilled hot dogs for a swim. The water was perfect – clear to four or five feet and slightly cool but welcoming after a hot day. I swam out a hundred yards or so, the shoreline and mountains shifting and redefining themselves with each stroke. I floated for some time on my back, the water cool around me, looking up at the heavy clouds. I could see our campfire through the pine trees and could hear muffled conversation and laughter. I could smell the rain that would come within the hour. The mountains off to the north shore stood brooding, shadowy and muscular. But that would be tomorrow’s task. That night, it was just about the most perfect scene I can imagine. My nephew, Ashten joined me for a swim as well and after drying off, we ate beside the campfire right before the rain started, forcing our retreat to the tents. I set up a camp chair in my tent and sat, neck craned against the nylon ceiling, sipping pinot noir from a metal coffee cup. I read my book by headlamp until my eyes grew heavy, then climbed into my bag and fell asleep to the sound of a gentle rain. It was a very good day. Some days, when struggling through the oppressive heat and humidity of a Carolina summer you fanaticize about cold weather. When stifling temperatures are exceeded only by spirit-crushing humidity levels, and the simple act of walking from the house to your car can leave you looking like the half-mad, sweat-streaked survivor of an Australian walk-a-bout gone horribly wrong – you have to fight the urge to pack up and move to the deep woods of Maine or the Canadian Rockies – possibly Siberia for that matter – anywhere, in fact, that might provide a bit of relief from the God-forsaken hot box that is the Carolinas in July and August. Funny though, how after three months of an unusually cold winter, July and August seem so far away and not quite so horrible after all. It was 70 degrees and sunny today. Its days like this – those glorious mid-February glimpses of spring – that bring me and the region of my birth to the peace table for talks. The days are getting gradually longer now and within a month these warm days will be the norm. By then, college baseball season will be well under way, filling the air with that magical sound of baseballs popping in catcher’s mits (and the not-so-magical sound of clinking metal bats). Spring football practice will be in full swing, stoking the eternal optimism of Gamecock football fans everywhere. A glass of red wine or bourbon will give way to samplings of lagers and pale ales from nearby breweries. Wool socks and heavy shoes will be replaced by flip flops, and mountain bikes will go on the rack in lieu of road bikes. March Madness, St. Patrick’s Day celebrations, grilling, camping, outdoor dining, a bit of color on previously cadaver-grey winter cheeks, sleeping with the windows open, the Cycle North Carolina spring ride and the general sense of health and well-being that comes with being neither too cold nor too hot… spring and all of the wonderful things it brings is nearly upon us, friends. So as my new bride and I are hiking (in shorts and t-shirts) in the South Carolina mountains this weekend I’ll soak it all in and feel just a bit of sympathy for those poor souls in Maine and Canada and, maybe just a little more appreciation for home. We didn’t summit yesterday. I’m disappointed, though trying to focus on the beauty of the things we saw and what we did accomplish. As planned, we left the hotel in Fort Collins at 10:30 p.m. and made the hour and a half drive along narrow two lane roads to the Long’s Peak parking area. On one stretch of highway – U.S. 34 – Michael reminded us of the Big Thompson Flood, which ripped through this very area in 1976 – 31 years ago almost to the day and almost exactly this time of night. A massive line of thunderstorms had stalled over the Thompson River drainage area creating a deadly wall of water, 19 feet high in some places, which washed away cars and homes and claimed the lives of 139 people. As we drove along, peering out at the shadowy canyon walls on both sides of the highway, it was impossible not to imagine that wall of water and the terrible confusion and screams which must have filled the inky darkness that fateful night. A sense of Mother Nature’s capacity for sudden and fantastic violence took the place – at least temporarily – of hiking talk. The car took on an eerie silence as we collectively tried to shake that creeping and unwelcome sense of dread and foreboding. When we arrived it was slightly cool, around 51 degrees. When we exited the car the midnight blackness and austere, shadowy surroundings left us feeling equal parts excitement and apprehension, though as the minutes passed excitement began to rally and apprehension was in full retreat. The scent of pine was invigorating as we made last minute adjustments to our packs and readied ourselves for the gargantuan task that lay ahead. I had on long hiking pants, a short sleeve wicking shirt and a blue, long-sleeve wind shirt. Although I was slightly cold with that ensemble, I knew that I would warm quickly once we began walking, so I left my fleece jacket in the pack. I made a last minute visit to the restroom and noticed a sign prominently displayed on the restroom door sternly warning hikers to keep the door closed on account of bears, leaving me to ponder the possibility that park management had experienced ongoing problems with bears leaving the toilet seat up, or possibly not flushing after themselves, (bears are notoriously ill-mannered and boorish, after all). Finally, with equipment ready and bladders voided, we donned our head lamps, grabbed our walking sticks, and with a great sense of optimism and expectation, hit the trail. The walking was immediately hard. The parking lot is at approximately 10,000 feet, and I could feel the altitude right away. I had a mild headache within the first 30 minutes, although I couldn’t immediately determine if it was from the altitude or if the strap of my head lamp was too tight. I loosened the strap and that seemed to help. The moon was nearly full and iridescent. It was brighter than I have ever seen it, and at times, when we got up above the tree line, you almost didn’t need a headlamp at all. The night grew increasingly colder as we gained altitude and got closer to dawn – it’s always coldest just before dawn, and around 3:30 a.m. we stopped to put on fleece jackets. I was silently cursing myself for not bringing gloves. Unfortunately, Michael’s left hamstring was giving him fits – he was really beginning to struggle, and around 4 a.m. he made the decision to turn back. I was disappointed for him, as this mountain has become somewhat of a nemesis for him over the years. In true Michael fashion though, he parted with encouraging words for Lee & I, and even gave me his gloves. At this point, I was feeling good, and could even look forward to regaining feeling in my fingers once the gloves did their work. My headache had even dissipated. For the next hour, Lee & I made slow progress. We were stopping every thirty yards or so as Lee was now feeling poorly. He was forced to walk with tennis shoes the first part of the hike as his hiking boots were in poor repair, and his feet and ankles were taking a beating as a result. Finally around 5 a.m. (or possibly 5:30), he decided to rest a bit and decide from there whether or not to proceed. He told me to go on without him. So, for the second time in as many years, I was on my own by the time I got to the Boulder field. I was mentally prepared for it this time though, and frankly relieved to be able to quicken the pace a bit. The Boulder field is a moonscape of rocks, ranging in size from your finger nail to your washing machine to your car. The key is to follow what loosely passes for the trail through this area. There are 12” high piles of rocks every 20 to 40 yards marking the trail, although there are many different such paths through the Boulder field, and none of them are particularly accommodating or easy to navigate. The sun was slowly rising at about this time, which cast a breathtaking light on the horizon behind me, and was beginning to reveal, bit by bit, the mountain in front of me, which had until then been just a shadowy, brooding mass. I was having much more success than last year at making my way through this area, so my spirits were high. They Key Hole loomed progressively larger as I made my way across the Boulder field. The Key Hole is an aptly named keyhole- shaped, jagged outcropping of rock at the top of the Boulder field through which you must pass to access the backside of the mountain & move on towards the summit. With great difficulty and much grunting (the Boulder field grows progressively steeper and more taxing as it rises up to meet the Key Hole), I reached, at long last, the Key Hole. I made it to the turret-shaped stone shelter perched there and named for Agnes Vaille, a lady who evidently perished there years ago after accomplishing an improbably impressive but ultimately mortal climbing feat. I gazed out over the Boulder field through the shelter windows and felt quite pleased with myself for navigating it, even while a tiny but persistent voice in my head kept reminding me that it would be hell going back down. At length, I exited the shelter and clambered over the last few boulders and onto the edge of the Key Hole itself. When my eyes finally saw what lay beyond I let out a completely involuntary and thoroughly amazed “wow”, which must have been audible to the two or three people nearest me by the nods and knowing smiles they gave me. The view was spectacular. The Key Hole gives way to Glacier Gorge and what must be a 1,000 foot drop off to the valley below, which in turn gives way to more impressive peaks on the other side. There were lakes at the valley bottom, and the whole scene was possibly the most breathtaking expression of natural beauty on which I have ever laid eyes. To the left, after passing through the Key Hole is the section called the Ledges. I was a little taken aback at what turned at this point from a strenuous but patently non-life-threatening hike into what seemed to me to be a death-defying high wire act. The Ledges, as the name would imply are exceedingly narrow ledges of rock which you must crawl, climb and pray yourself around and over, usually on all fours, all the while with quivering limbs and a non-quite-believing-I’m doing this sort of awe over the fact that a slip of a foot or a lost hand grip could send you to a quick but inconceivably horrific and unquestionably messy death on the valley floor below. It is a study in overcoming fear. Add now to the mix a vague but persistent feeling of queasiness. Altitude sickness. I made it across nearly all of the Ledges and came just to the section called the Trough. At this point, physically beat, gasping for breath, and needing to sit down as badly as anyone ever has, I sat heavily down on a rocky ledge. I was exhausted, and the altitude sickness began to manifest itself with a strong headache, dizziness and slight nausea. Not exactly the way one wants to be feeling on a high ledge, some 13,000 feet in the air. I planned to take a quick nap in the hopes that it would pass, but sleep would not come. A local hiker and his wife, both obviously perfectly comfortable & acclimated, stopped to say hello (people are exceedingly friendly on the mountain). He had hiked Long’s before, and I asked him what exactly lay ahead for me between there and the summit. His expression instantly turned serious. He told me the hardest hiking lay ahead, possibly an hour or more of it, and the physical challenge I had experienced thus far would pale in comparison to what was next. The Trough was a mad, near vertical scramble on all fours up loose boulders. The Narrows, beyond that, was another insanely narrow rocky shelf with drop offs that would make your knees buckle just seeing it on TV, much less from 14,000 feet up on the mountain itself. The summit was just beyond that. I was probably only ½ to ¾ of a mile from the summit at this point. I had decisions to make. The altitude sickness wasn’t subsiding as I had hoped – if anything it seemed to be worsening. The summit lay another 1,250 vertical feet away. My current dizziness & nausea began only about the last 500 feet or so of the climb, and I wondered what effect 1,250 additional feet of climbing would have on my condition. It could only deteriorate. I seemed to be in some hazy, grey area where bad things could happen quickly. I decided to turn around. Disappointed, but accepting defeat, because as the old saying goes, sometimes discretion is the better part of valor, I turned my back on the summit and started the long walk back to the car. (After a good nights sleep, I woke up this morning and it occurred to me that the simple act of donning a back pack and venturing into the woods at 12 midnight in and of itself places you in a hazy, grey area where bad things can happen quickly. Admittedly, I’m no Edmund Hillary, but I would live to hike another day). Going back over the Ledges was no less harrowing, other than the fact that I knew what to expect this time. I am amazed that the National Park Service could allow just anybody with a wild hair to come here and tempt fate like this, and I am a little skeptical of the sign at the trail head which informs you that 56 people have died on this mountain over the years. That seems an exceedingly low number, given the terrain I’ve just seen, and I wonder if the sign has been updated in the last forty years or so. I was immensely relieved to get back to the Key Hole, where I rested for a while and chatted with a nice couple from England who were on their way up and seemed a trifle daunted by the task at hand. I offered some encouraging words and bid them good luck, then turned my gaze upon the Boulder field below. I cannot go to too great of lengths to explain just how hard, how thoroughly punishing it is to go back down the Boulder field. As taxing as it is to go up – and it is a challenge – it is one hundred times harder to go down. The rocks punish your joints mercilessly with each step. And it never escapes your notice, even for a moment that you have a heavy backpack on, which increases the stress on your knees and ankles exponentially. Entering the Boulder field at dawn, you only sense the expansiveness of it. Coming back, with the sun up and the jaunty optimism of early on replaced by a gritty realism, the expansiveness of the Bounder field roars into your consciencness. It commands your attention, and you soon realize that even though it costs no money to walk this mountain, Long’s will not let you go without paying some serious dues. Not to mention the fact that going up, you can see the top of the Bounder field (the Key Hole), and it’s always easier to prepare yourself mentally and emotionally when you can see the end in sight. Going down, all you can see is a vast sea of boulders. It’s impossible, at least from the vantage point of a 5’11” man to get an accurate sense of exactly how far you have to go. I was constantly flummoxed by how far I had come down, yet how far it seemed I still had to go. The end of the Boulder field seems to retreat with every step, until you begin to wonder if you will ever, ever exit it. And always the pounding, downhill slog, wondering with each step if your knee or ankle will give way and buckle with a sickening crack under the stress of your weight and that of your pack. This was the low point of the hike. At long last, around 10:30, and after two hours, I exited the Boulder field. Now the goal was to make it down below the tree line, and from there, back to the parking lot. The weather changes quickly and without notice on the mountain, and every thirty minutes or so I would have to stop, take off my pack and add or remove clothing accordingly. The miles go by slowly on the way down. Excruciatingly, impossibly slowly. The first mile maker you come to tells you with an emotional detachment, even a mocking coldness, that the parking lot is 3.5 miles away. Now, 3.5 miles doesn’t sound like far to go when you exit the cozy confines of your house for a leisurely stroll, recently fed and comfortably rested, but after climbing Long’s Peak (or most of it), it seems a cruel joke and a near impossible task. After what seems like easily 3.5 miles, you come to the second mile marker, which sneeringly informs you that it is 2.5 miles to the parking lot, which inevitably brings about much bitter cursing and earnest vows never to lace up another pair of hiking boots for the balance of one’s life. You are only vaguely familiar with this part of the trail. It was dark when you came through the first time, and you were full of optimism and vigor. The walk back is quite a different story. The light of day, combined with your own grueling weariness sheds a stark light on just how demanding this little hike really is. This is not to say that the walk back is completely void of it’s own small rewards. The scenery is, as everywhere on the walk, absolutely beautiful. The Alpine views at every turn are postcard-worthy, and even amid the din of protests from your feet and joints, you are often taken aback by the exquisite splendor surrounding you. It takes a little more effort to appreciate the splendor at this point – it is natural to fall into a state of robotic trudging, blankly staring at the ground and obsessing over your end-of-hike meal, but it is worth the effort. Finally, at approximately 2 p.m., I exited the woods and walked, mercifully into the parking lot to find Michael & Lee waiting for me & ready to go. The last mile or so my progress seemed to slow down to a crawl – so slowly that small children and old men (I think, even one on crutches) seemed to pass me with a swiftness and ease that was truly humbling. I took off my pack, dumped it in the back of the car, and I immediately felt a hundred pounds lighter, as if I could levitate and bound around like Neil Armstrong on the moon. But all I wanted to do was sit down. I climbed into the back seat, and was immediately fighting sleep while attempting to participate in conversation. We stopped by McDonald’s in Estes Park and I ordered an obscene amount of food. I ate greedily and luxuriated in the sheer ecstasy of sitting down and eating something besides trail mix, even if it was McDonald’s. Finally back at the hotel, I showered and slept and then slept some more. Despite my complaints, I feel good today – just a little sore and not too much worse for the wear. Yesterday afternoon I swore I would never under any circumstances go hiking again. Today I’m on the fence. Tomorrow I’ll be planning next year’s trip. Such is the nature of these things, I suppose.